Preview images and spoiler description for Jane the Virgin "Chapter Eighty-Six"
The CW has released some photos to promote “Chapter Eighty-Six” of Jane The Virgin which airs Wednesday, April 24 on the network. A SPECIAL UNICORN – With everything that has been going on, Jane (Gina Rodriguez) reluctantly agrees to let Rogelio (Jaime Camil) throw her a big 30th birthday party. Jane’s mentor gives her some important advice that may help her start writing again. Meanwhile, Petra (Yael Grobglas) thinks she and JR (guest star Rosario Dawson) are finally in a good place, until she realizes that JR might see things differently. Justin Baldoni, Andrea Navedo and Ivonne Coll also star. Gina Lamar directed the episode written by Joni Lefkowitz & Madeline Hendricks (#505). Original airdate 4/24/2019. 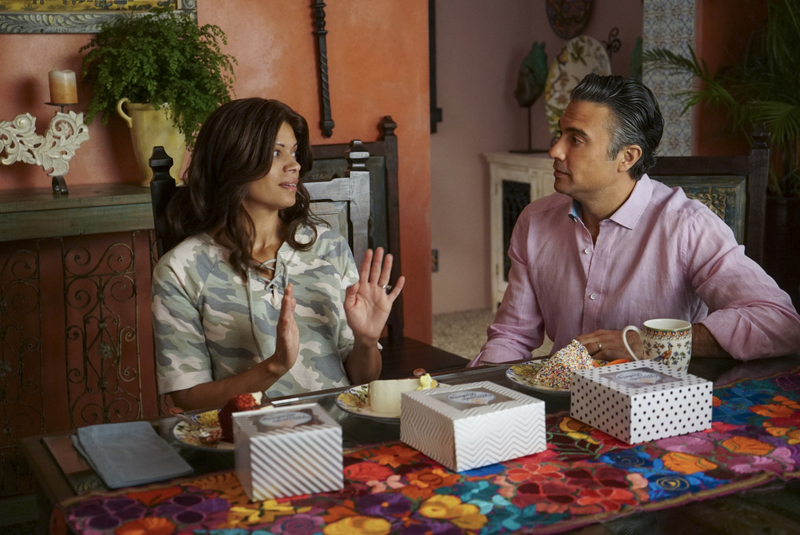 Jane The Virgin -- "Chapter Eighty-Six" -- Image Number: JAV505a_0004.jpg -- Pictured (L-R): Andrea Navedo as Xo and Jaime Camil as Rogelio -- Photo: Richard Foreman, Jr./The CW -- ÃÂ© 2019 The CW Network, LLC All Rights Reserved.